This Grab Bag contains a huge variety of items to paint. 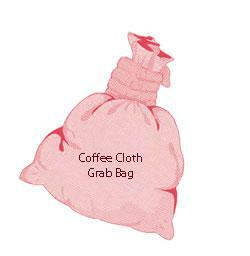 Each bag contains a beautiful coffee-cloth, one or two other linen items such as a runner, a cushion cover, a placemat etc. Plus at least 4 non-woven items such as pictures and wall-hangings. Plus a lovely linen wall-hanging hoop and transfers. MEGA VALUE!